Before replacing bcm, perform вЂњread configurationвЂќ to save or print current vehicle specification. Refer to bcs-116, "configuration (bcm) : description". Remove instrument lower panel lh and instrument side finisher lh. Refer to ip-21, "removal and installation". Remove fuse block (j/b) screws (a) and position (bcm) aside. Remove the screws (A) from the BCM (1). Disconnect the harness connectors and remove the bcm. Perform вЂњconfiguration (bcm)вЂќ when replacing bcm. Refer to bcs-116, "configuration (bcm) : description"
Be sure to perform the system initialization (nats) when replacing bcm. Refer to bcs-115, "additional service when replacing control unit (bcm) : work procedure". When replacing bcm, if new bcm does not come with keyfobs attached, all existing keyfobs must be re-registered. Shown with the steering wheel removed for clarity only. Before servicing, turn the ignition switch off, disconnect both battery terminals and wait at least three minutes. Do not use air or electric tools when removing or installing the combination switch. Disconnect both the negative and positive battery terminals, then wait at least three minutes. Refer to PG- 50, "Removal and Installation (Battery)". 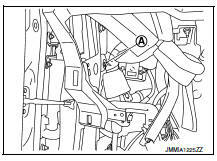 Remove the steering column covers. Refer to ip-16, "removal and installation". Rotate steering wheel clockwise to access first combination switch bolt and remove. 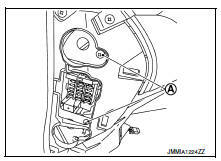 Rotate steering wheel counter-clockwise to access second combination switch bolt and remove. Disconnect the harness connector from the combination switch and remove. 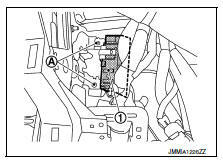 After the work is completed, make sure no system malfunction is detected by air bag warning lamp. In case a malfunction is detected by the air bag warning lamp, reset with the self-diagnosis function and delete the memory with consult. If a malfunction is still detected after the above operation, perform self-diagnosis to repair malfunctions. Refer to src-41, "additional service when replacing control unit : special repair requirement".